Goals are such a small sample stat that even over a full season you’ll see some raw figures that may not be overly indicative of ability. As a general rule, you can normally expect a player’s goal total to bounce back from a down season if the player is still producing shots on goal but suffered a significant drop in shooting percentage. 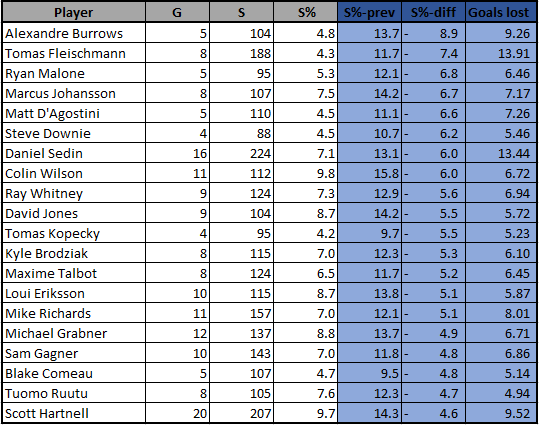 Alex Burrows’ 8.9% drop in shooting percentage was the highest among all qualified players, and he scored only 5 goals as a result. Tomas Fleischmann and Daniel Sedin both lost more than 13 goals to their drops in shooting percentage. 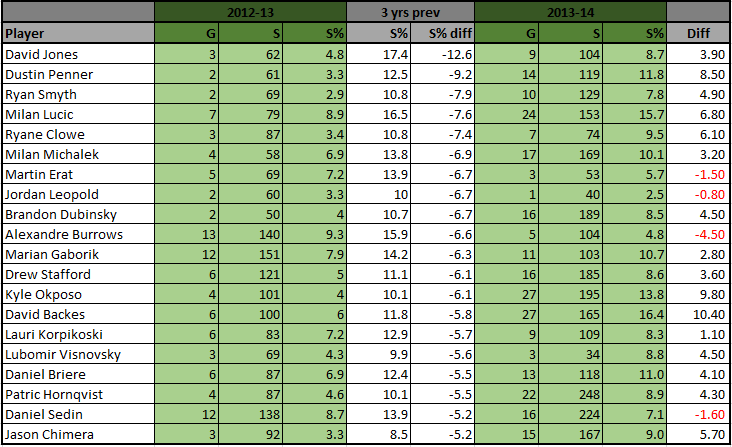 Sixteen of twenty saw their shooting percentages increase the following season. On the whole, the group saw a shooting percentage increase of more than 4 percent. So if you hold shares in Tomas Fleischmann or Alex Burrows, don’t be too quick to sell. ← Is it time to appoint a new jester?